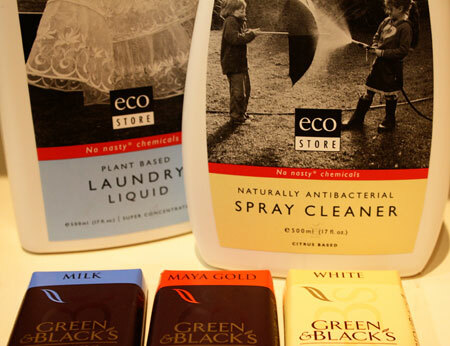 I was recently given some EcoStore cleaning products to try out. I’m not one to buy many cleaning products for general house cleaning as I use the bi-carb, vinegar and water to do most things. If I do need to buy something I try and get something without chemicals as I figure there’s enough of those in my day-to-day life without purposely adding more. I was sent some clothes washing liquid and anti-bacterial spray cleanser. The clothes washing liquid is really nice because it has a eucalyptus smell so when I pull a clean load of washing out that’s what I can smell. Once the clothes are dried, however, the smell is no longer there. I have a front loader and you only have to put about a tablespoon in for each load because it’s concentrated. Here’s some other reviews about the product and it sounds like eczema sufferers benefit from using this type of laundry washing liquid. I must admit I haven’t used the anti-bacterial spray quite so much as this isn’t something I normally use anyway. I’m normally a damp cloth kind of cleaner and who can tell if it’s really getting rid of those bacteria anyway. The EcoStore website has a list of stockists and you can also buy online. What I didn’t mention in the title of this post was that I was also sent some Green & Blacks Organic chocolate to review. I LOVE this stuff – the white chocolate is the best chocolate in the world and it was hot property in this household. The milk and dark chocolate is pretty good too. My local Foodland sells these little blocks of chocolate and it’s my special treat to pick one up just about each time I go shopping (weekly). If you’ve never tried it I really recommend it. Especially the white chocolate. Looks like someone’s trying to steal it! I left a little block of milk chocolate out for my sister who babysat my son one evening and instead of saying thank you she said that she prefers white chocolate. 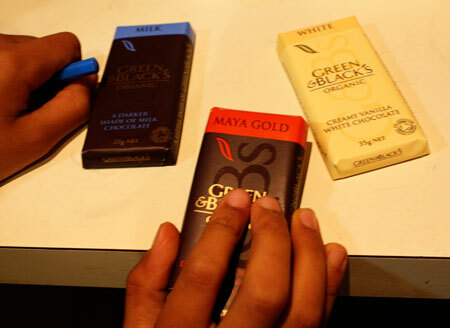 and a selection of Green & Black’s organic chocolate for a reward when you’ve done all that cleaning. All you need to do to enter is leave a comment outlining why you prefer to use natural cleaning products rather than chemical laden ones – or why you’d like to start using natural cleaning products. This is only open to people with an Australian address and closes at midnight on Monday 13 July. I’d like to start using natural products, because lately I’ve found I get a terrible headache from the fumes of the chemical products. If they affect me in such a way, I dread to think of what they could do to my children! I’d like to start using natural products to help save the environment but ,most importantly reduce the chemical load I expose my children too. I am concerned because chemicals cross the skin barrier (and enter lungs) and enter the blood stream and end up goodness knows where. I use plain water to wipe down things more often than not or with hot soapy dishwater (biodegradeable) and also eucalypus oil diluted in water in a spray bottle .It smells lovely and is good for the nose LOL.